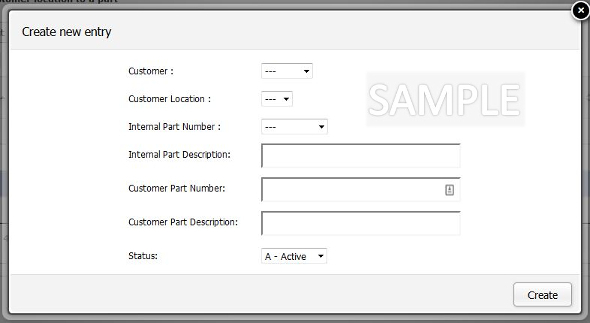 The Customers tab is where you will maintain your list of Customers, Locations, and Location / Parts. Each Customer must have at least one Location listed. 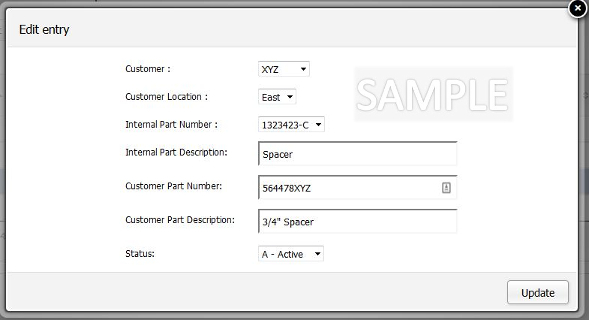 The Location / Part tab is where you list each of the parts they purchase at a given location. Customer Name: The full-length name of your Customer. Customer Nickname: The shortened version of your Customers Name, displayed throughout PiQ. Billing Address: The address to which invoices will be sent for payment. 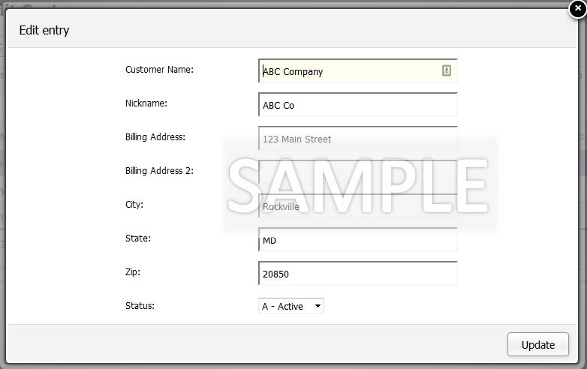 Billing Address2: A second line of information for the Billing Address. City, State, Zip: The remaining address fields for this location. Status: The Status (Active or Inactive) for this customer. This is the Create new entry form to add a New Customer. For a description of each field, read the table column descriptions above. Customer Nickname: Enter a shortened version of your Customers Name. This is limited to 8 characters, so be concise. Billing Address: Enter the address to which invoices will be sent for payment. 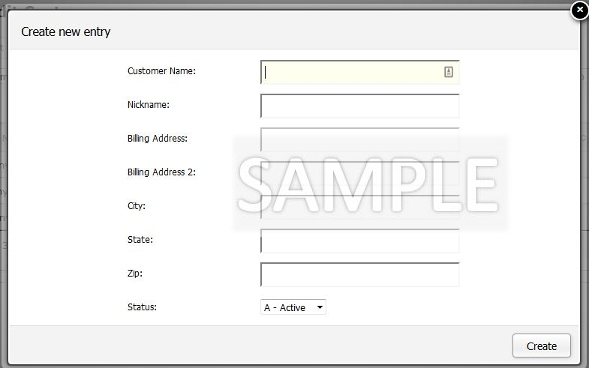 This is the Edit Entry form to edit an Existing Customer record. For a description of each field, read the Add a New Customer text above. To begin an Edit on an Existing Customer, first you must click on the table row you wish to edit. Once a row is highlighted, the Edit button will become active. 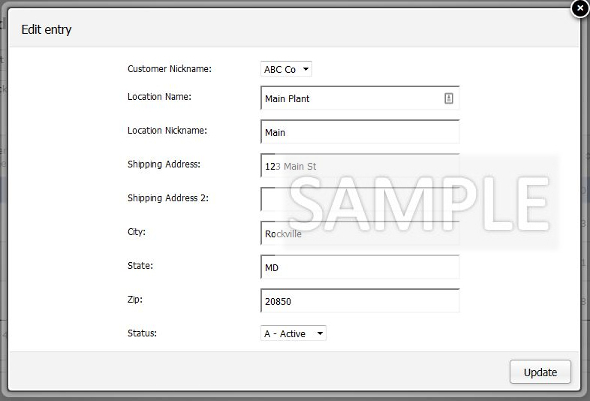 The form will automatically populate with all of the information from the row you selected. Edit the field that you wish to change and click “Update” to complete the edit. Note: If you change a Customer from Active to Inactive status, you must also remember to Inactivate any Locations that correspond to that Customer. You will be returned to the table view, and your edited line item will be momentarily highlighted in the table. A Customer, once established in PiQ, cannot be deleted (only moved to Inactive Status.) This is to preserve your history for this Customer. 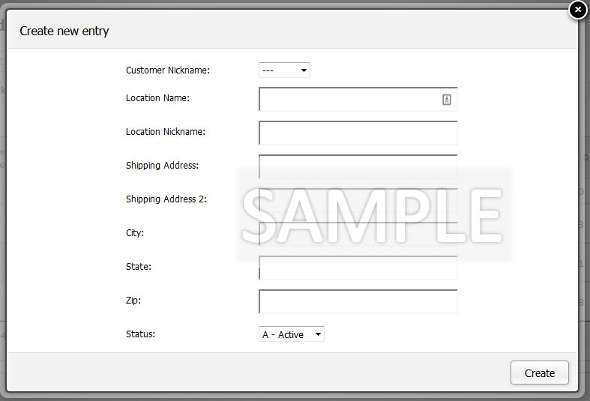 The Customer Locations tab is where you will assign one or more Shipping Locations for each Customer. At least one Shipping Location is required for each Customer. Customer Nickname: The Nickname you have assigned to your Customer. Location Name: The full-length name for this Customer Location. Location Nickname: The shortened version of your Customers Location Name, displayed throughout PiQ. Shipping Address: The address to which you will be shipping product. Shipping Address2: A second line of information for the Shipping Address. Status: New Customer Locations are set to Active by default. A Customer Location, once established, cannot be deleted (only set to Inactive Status.) This is to maintain your history for this Location. This is the Create new entry form to add a New Customer Location. For a description of each field, read the Table column descriptions above. Customer Nickname: Select the Customer Nickname for the Customer you will be adding this Location. Location Nickname: Enter a shortened version of your Customers Location Name. The limit is 8 characters, so be concise. Once you have completed entering the data for this Customer Location, click “Create” and you’re all done! You will be returned to the table view, and your new line item will be momentarily highlighted in the table. You are now ready to enter a Customer Location Part so you can enter orders for this location. See instructions below. Edit an Existing Customer Location. To begin an Edit on an Existing Customer Location, first you must click on the table row you wish to edit. Once a row is highlighted, the Edit button will become active. The Location / Part Table is where you will assign each part purchased by this Customer to be shipped to this Location. Each Customer / Location / Part is a unique record in PiQ. Customer: The Nickname you have assigned to your Customer. Location: The Nickname you have assigned to this Customer Location. Internal Part Number: Your part number to be shipped to this Customer Location. Internal Part Description: Your description of the part. Customer Part Number: The Part Number used by this Customer Location. Customer Part Description: The description of the part used by this Customer Location. Status: Active for parts they currently purchase, Inactive for parts no longer purchased. A Location / Part, once established, cannot be deleted (only set to Inactive Status.) This is to maintain your history for this Location / Part. This is the Create new entry form to add a New Location / Part. For a description of each field, read the Table column descriptions above. Status: New Location / Parts are set to Active by default. Once you have completed entering the data for this Location / Part, click “Create” and you’re all done! You will be returned to the table view, and your new line item will be momentarily highlighted in the table. You are now ready to create an order for this Customer Location Part on the Orders tab. Edit an Existing Location / Part. To begin an Edit on an Existing Location / Part, first you must click on the table row you wish to edit. Once a row is highlighted, the Edit button will become active. A Location / Part , once established, cannot be deleted (only set to Inactive Status.) This is to maintain your history for this Location / Part.